First Great Western has apologised to passengers for delays and 'severe overcrowding' as thousands of rugby fans tried to travel to Cardiff ahead of the Millennium Stadium's first 2015 World Cup game. Arriva Trains Wales say measures have been put in place but people travelling on trains should expect delays. Rugby fans heading to Cardiff for Wales' first game of the Rugby World Cup have been warned to allow extra time due to large crowds using train services. Trains to Cardiff Central are very busy today with many fans heading to #WAL v #URU - you should allow extra time to complete your journey. We have provided extra capacity where possible on routes into Cardiff but trains will still be busy with lots of rugby fans today. 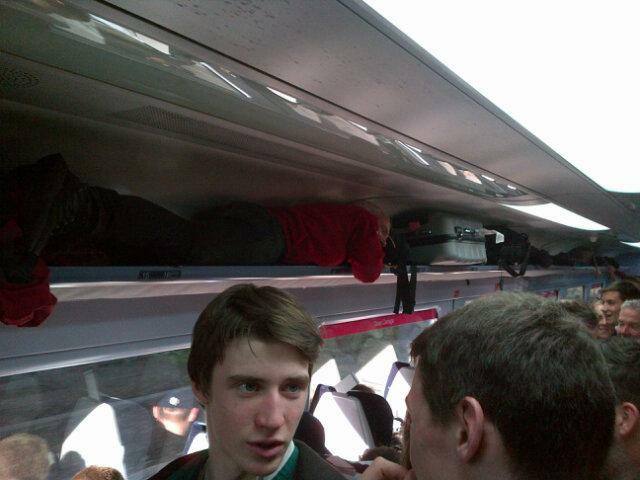 Yesterday, First Great Western apologised to passengers for delays and 'severe overcrowding' on train services towards Cardiff ahead of the Millennium Stadium's game of the tournament. 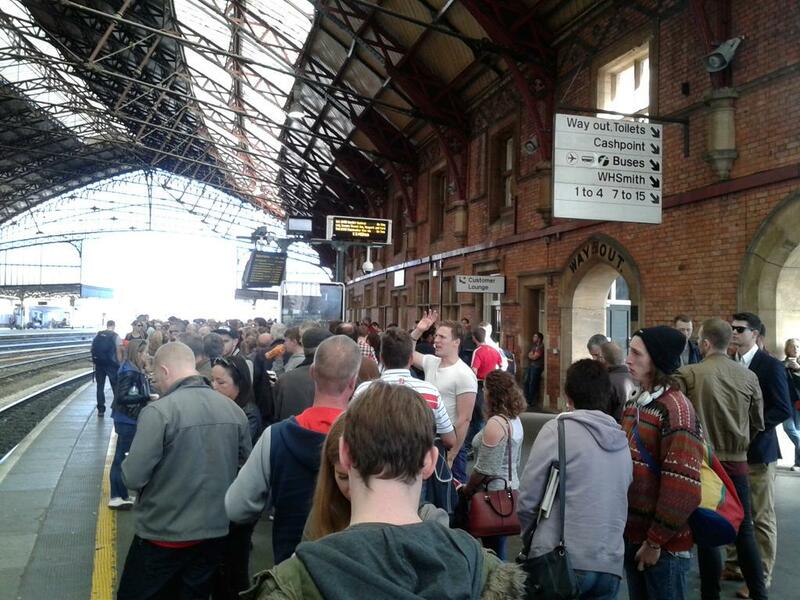 There are delays on trains out of Cardiff Central due to overcrowding. Arriva Trains Wales and First Great Western Services are behind schedule by around 40 minutes. It follows a day of disruption due to 'underestimated' numbers of rugby fans travelling to the city to watch Ireland play Canada at the Millennium Stadium. Rugby fans heading out of Cardiff this evening have taken to Twitter to air their frustrations over the availability of trains. 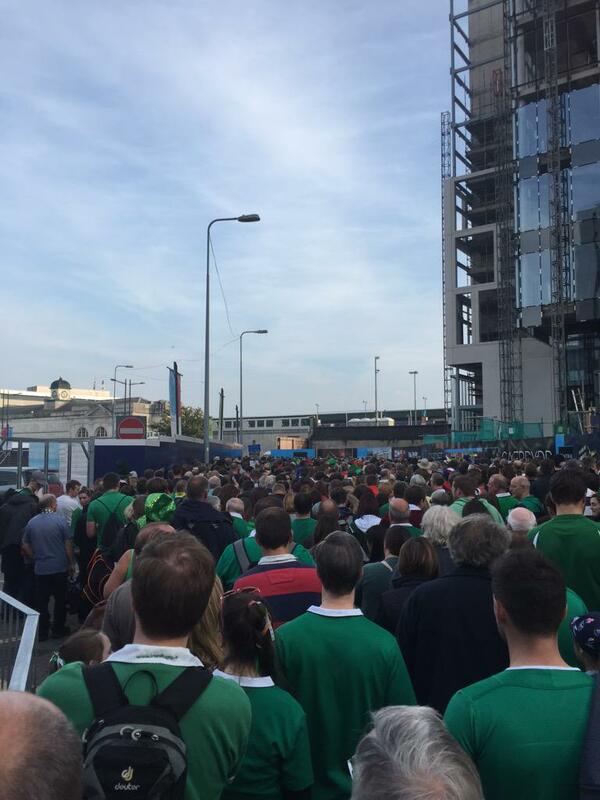 It follows disruption before the Ireland v Canada match today, which saw some fans make it to the Millennium Stadium with only minutes before kick off. First Great Western have apologised, saying they 'underestimated' the number of people wanting to travel. Arriva Trains Wales says it is working to get fans home as quickly as possible, with more than 10,000 people passing through Cardiff Central station. First Great Western has apologised to train passengers who have experienced delays over overcrowding on its services on Saturday, as thousands try to reach Cardiff for the Millennium Stadium's first Rugby World Cup match. FGW said passenger numbers were "significantly higher" than it expected, it has now provided an extra 1,500 seats today, and will be reviewing arrangements for future matches. We're sorry for anyone caught up on busy services ahead of today's match at the Millennium Stadium. We were already providing an additional 8,000 additional seats into Cardiff for the game, which was in line with estimates of the number of customers expected to travel. Although we warned customers that services were likely to be very busy, the number of people wishing to travel is significantly higher than we would normally expect from this type of event. 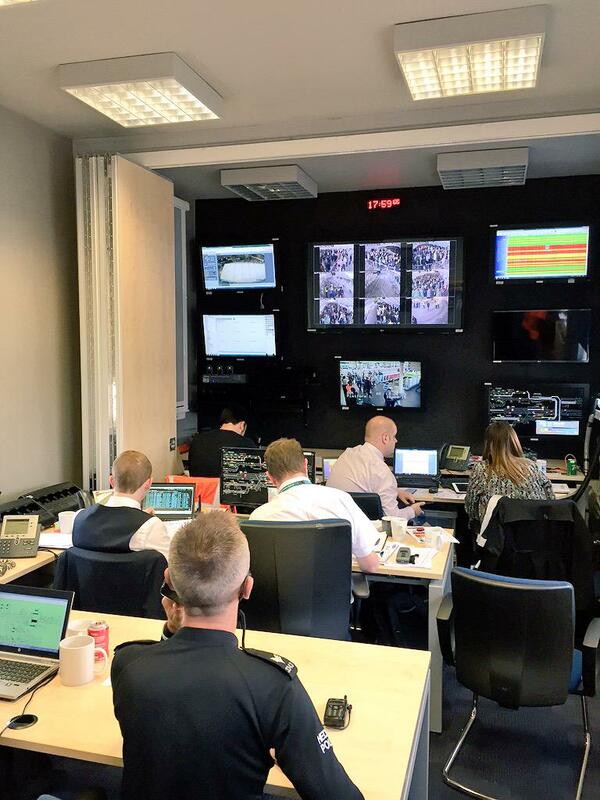 We have now engaged our contingency arrangements which will provide at least 1,500 additional seats and will be monitoring the situation very closely. We will be reviewing arrangements for future Rugby events during the World Cup, however there will be a limit to what we can provide without impacting other customers. We will be speaking to organisers to see how we can contribute further to the overall mix of transport options for fans in later matches. Delays on train services towards Cardiff have left many rugby fans fearing they won't make it to the Millennium Stadium in time for kick off between Ireland and Canada at 2.30pm this afternoon. @fgw waiting patiently at Bristol Parkway not being given any information by staff. Are we going to get to Cardiff in time for the match? Passengers have also complained about overcrowding on First Great Western trains from London, Reading, Swindon and Bristol.